horseshoe gang New Music: Horseshoe Gang "Shoes Fall Off"
New Music: Horseshoe Gang "Shoes Fall Off"
Long Beach crew Horseshoe Gang return with their forthcoming new album Dope Lyrics Matter which will be released on 12-8-17---AKA COB Independence Day (coinciding with the release of KXNG Crooked’s Good Vs Evil 2: The Red Empire). Mentored and encouraged by their elder brother KXNG Crooked, the Horseshoe Gang embody the term “family affair, “as brothers Demetrius, Julius, Kenny and Dice formed as a group before they even reached their teenage years. A vital component in the west coast rap scene for close to a decade now, HSG have earned their stripes the old-fashioned way; by putting out good music that increases their substantial following with each subsequent release. That momentum continues with their forthcoming album Dope Lyrics Matter. HSG is not a group that creates music based off of “vibes.” Rather, these brothers competitively strive to go after each other’s necks; bar for bar with each verse. That competitive streak was put on full display a few years ago after Funk Volume (Hopsin, Dizzy Wright, Jarren Benton) appeared on Sway In The Morning and challenged to face off with any group for 500K. HSG swiftly accepted the challenge when they visited Sway which resulted in back-to-back-to-back responses from the two respective camps. Dope Lyrics Matter represents the group’s psyche, both in title and content. HSG’s reputation as ruthless lyricists delivering quick-fire rhymes, hooks and vastly superior wordplay is well-established, but Dope Lyrics Matter also displays versatility in themes and concepts; with humor, rage and pathos evident throughout. Today, via an exclusive premiere with Mass Appeal, HSG releases the first single, “Shoes Fall Off” from Dope Lyrics Matter. "Considering the fact that Hip-Hop is now recognized as the most popular genre in music, we feel it's important for dope lyrics to be properly represented” HSG stated to Mass Appeal. Dope Lyrics Matter is meant to highlight lyricism, so our supporters should expect classic Horseshoe Gang material on this project---bars and more bars!" 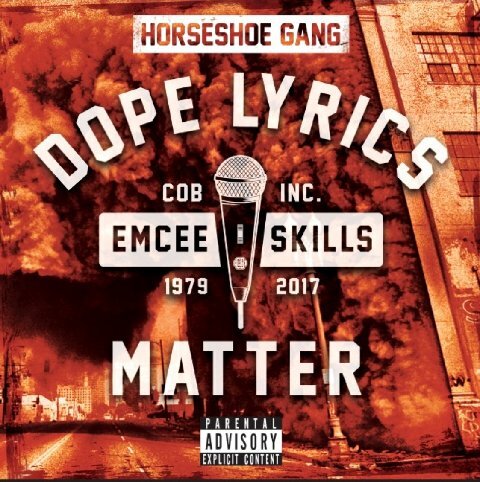 Horseshoe Gang’s Dope Lyrics Matter will be released on 12-8-17 via COB/EMPIRE.